Some of you may remember my original "Meet Maddy" post in March 2018. Maddy was my first paper clay doll. 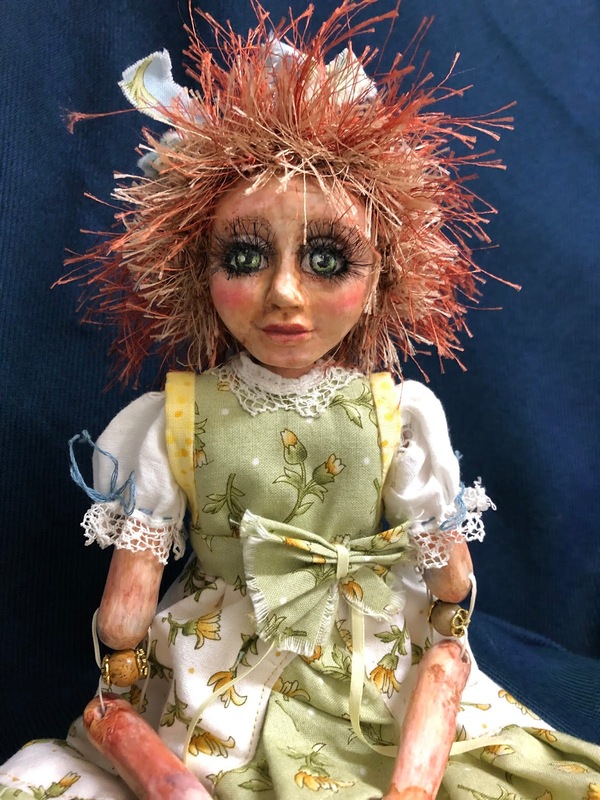 I liked her little girl look, but she was not something I would be proud to post for sale. 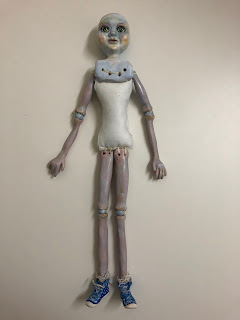 I made two more paper clay dolls during the year, Libby and Ivy. I am always re-using and up-cycling items, so decided to update Maddy using lessons learned. Here are a few pictures comparing the new Maddy with the old. The original post follows in case you are interested in learning what not to do! New Maddy's face is a bit more oval. Old Maddy's face was too flat and gave her a scary "Chucky" look. 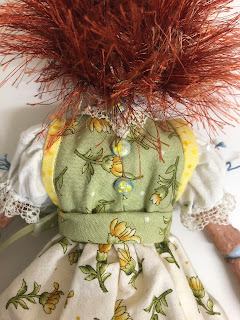 I added a second color of yarn to her hair and applied false eyelashes. The original beaded joints were shaped to accommodate the bead. As it turns out, that limited the range of motion. The new beaded joints are more round. Although this makes the joints very loose, they can be posed in almost any position in which they can be propped. I liked the sport shoes old Maddy was wearing, but wanted new Maddy to look more vintage, so switched to Mary Jane shoes. I struggled with smoothing the skin on the original doll and eventually added a layer of tissue paper over the clay to give it the wrinkled look. All of that was sanded away for new Maddy, and a new layer of clay was smoothed over. I used chalk and acrylic paints to exaggerate and emphasize the clay surface irregularities to give her the look of an old doll. The 10mm tumbled jasper gemstone beads enhance her vintage look. I am much happier with new Maddy. She is available in my Etsy Shop. For a video slideshow, visit my Urban Stitcher ® YouTube Channel: Paper Clay Art Doll Maddy. 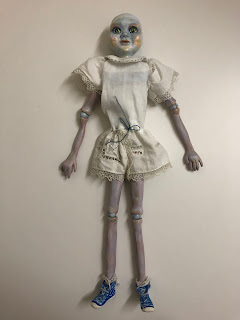 I have been making dolls of all shapes and sizes for years, but Maddy is my first paper clay doll. 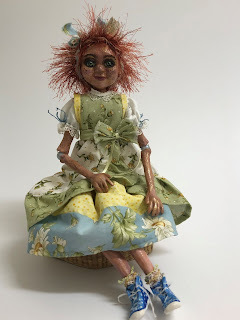 I have used paper clay for other projects and chose to stay with it for this doll. Although happy with the final form, Maddy and I struggled through three different skin colors, two outfits, and three wigs. 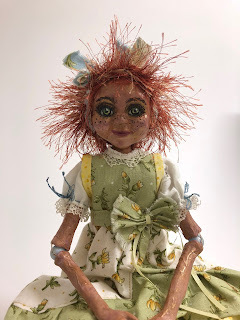 There were times when I was sure this would be my last clay doll, but now that she is done, I think I may try it again using some of the lessons learned. Maddy is 16 inches tall. Blue beads serve as elbow and knee joints. 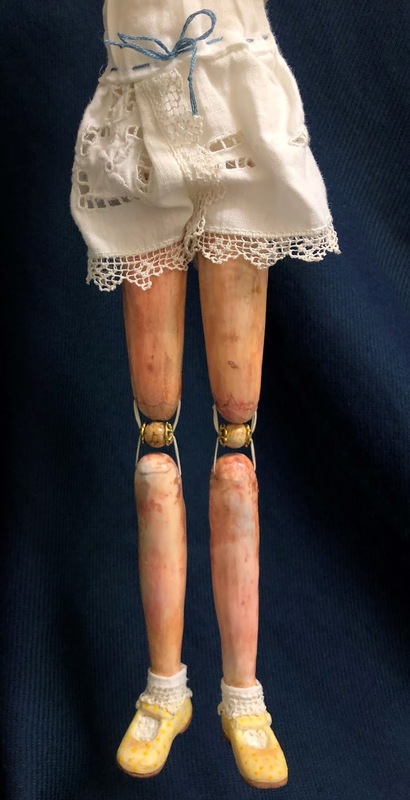 Her head, shoulders and hips are attached to a soft body. Clothes are permanently affixed. I drew the limbs on a piece of paper to use as reference for size and shape. I used the beads to shape the clay where they would fit at knee and elbow. While the clay was still wet, a skewer was used to create a hole where waxed thread would join the beads and limbs. Her sneakers are made of clay with embroidery thread for laces. 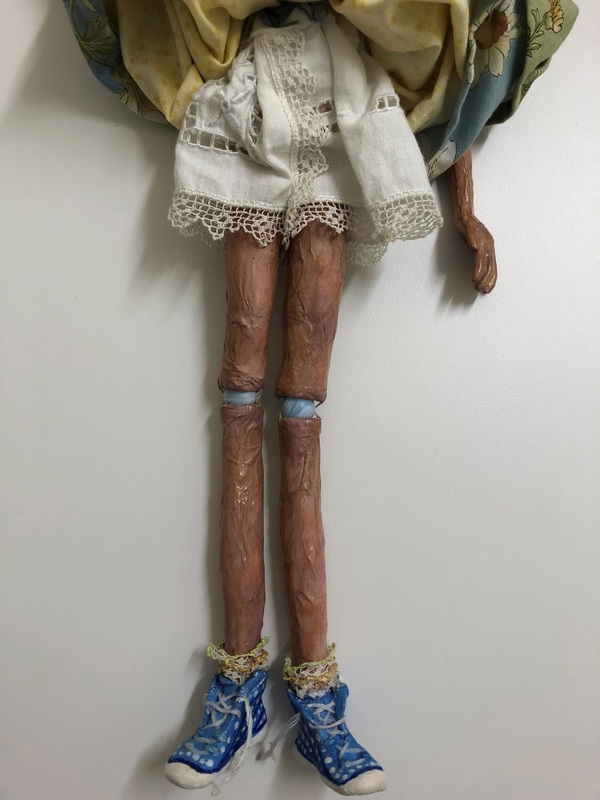 The limbs and sneakers were painted with layers of blue, pink and gold acrylic paint before joining with the beads. Maddy's head, neck and upper torso is one piece. Her head started as a small ball of aluminum foil wrapped around the end of about four inches of coat hanger wire. Another piece of foil was used to frame the upper torso. The clay was shaped around the foil pieces. After the clay was dry, the foil framing her upper torso was removed. The wire extending from her head was inserted into the stuffed, soft body. All the parts are affixed to the soft body with waxed button/carpet thread. Bits of clay were used to fill the holes around the waxed thread. Even though her clothes are not be removable, she wears a jumper style dress requiring a collar, sleeves and underwear. I used an old doily to fashion one piece. I had this piece in place before recognizing I would not be happy with the blue skin color. The underclothes were removed and she was sanded, head to toe. I have no pictures of the difficult transition from blue to brown. It was very difficult to sand and paint after assembled. Even after sanding, the skin was not as smooth as I hoped. I used a bit of water and paint brushes to smooth the clay, but adding too much water can cause cracking as the paper clay dries. It was a frustrating cycle of smoothing, drying and sanding. I finally decided to embrace the textured skin, and actually added sheets of tissue, in paper mache style, to all her body parts including face. After that dried, I painted again and used the Paverpol product to harden and protect the clay parts. She was first dressed in a blue jumper. After changing the color of her skin, I felt she needed brighter clothing. You may be able to see on the back of her dress three small buttons made from clay and painted to match her jumper. The original collar was removed from the underwear and a lace color was added to match the sleeves. I wanted to do something different for her hair. I love to buy local, and I tried using natural wool fibers and yarns from our beautiful local yarn shop, Pearl Fiber Arts. But, I could not get the look I wanted from the wool. In the end, I purchased eyelash yarns from eBay vendor, BrokeMarys Yarns. I simply crocheted a small cap with two eyelash yarns, copper and light brown. 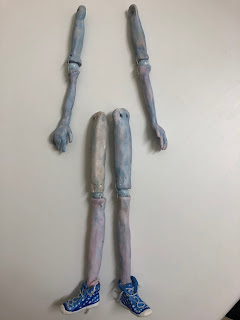 Well, that is my clay doll adventure. I will try another,,,,,,, later. I am off to work on a couple of sewing projects that have been occupying my mind. Thank you for visiting. I hope you will drop in again. Pretty Awesome talent you have!